Ten years, ten authors, ten critics. 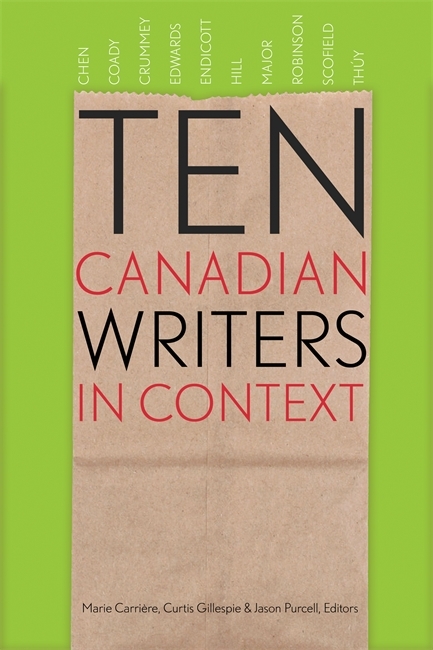 The Canadian Literature Centre/Centre de littérature canadienne reached into its Brown Bag Lunch Reading Series to present a sampling of some of the most diverse and powerful voices in contemporary Canadian literature from Newfoundland to British Columbia. Each piece is accompanied by a concise critical essay addressing the author’s writerly preoccupations and practices. The literary selections and essays will be of interest to engaged readers who want direction in analyzing these authors’ work as well as to teachers and students of Canadian literature. The readings in English and in French have been recorded, and can be seen and heard in a digital archive titled Inside the Bag: Can Lit Alive! Marie Carrière is the Director of the Canadian Literature Centre/Centre de littérature canadienne (CLC) and teaches English, French, and Comparative Literature at the University of Alberta. Curtis Gillespie is the author of five books and co-founder of the narrative journalism magazine Eighteen Bridges. Jason Purcell is the Communications Officer at the Canadian Literature Centre/Centre de littérature canadienne (CLC).